(a) How high will water rise in a glass capillary tube with a 0.500-mm radius? 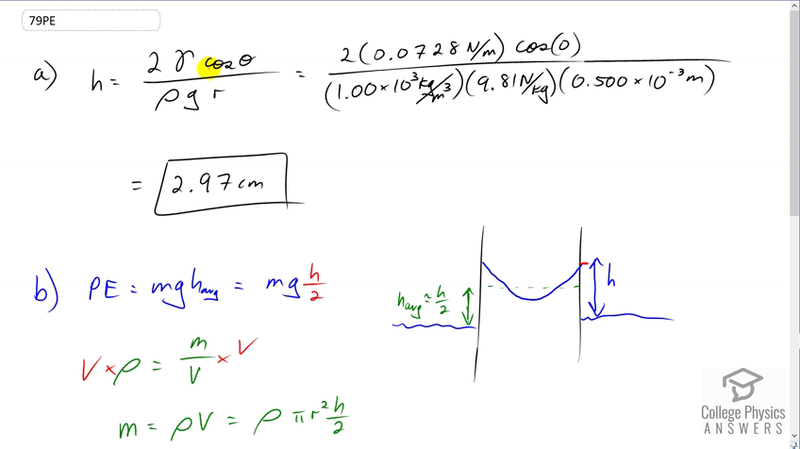 (b) How much gravitational potential energy does the water gain? (c) Discuss possible sources of this energy. Work is done by the surface tension. This work causes the change in gravitational potential energy. This is College Physics Answers with Shaun Dychko. The height that the water will rise up this tube due to the capillary action is two times the water's surface tension times cosine of the contact angle between the water and the material the tube is made out of which is glass, divided by the density of water times g times the radius the tube. So that's two times 0.0728 Newtons per meter surface tension for water, times cosine of zero, divided by the density of water, one times ten to the three kilograms per cubic meter, times 9.8 times 0.5 times ten to the minus three meters, radius of the tube. So it will rise to a height of 2.97 centimeters. The next question is what will be the gravitational potential energy gained by the water through it being raised to this height? Well, we're going to multiply the weight of the water m g by the average height that it rises because the water will rise to a maximum of h but it has this meniscus here. It has this u-shape to it so not all of the water in this column gets raised to this maximum height. So we look for some average that will have an equal amount of water above the average that is equal to the amount of air below the average. This average looks like it's about half the height. So we'll say eight over two is our average height. So then we want to find out what the mass of water that's been raised is and so we have density is mass divided by volume and then multiply both sides by volume and you solve for m. It's the density times the volume. The volume will be the cross-sectional area of this water column multiplied by its average height h over two. So then we substitute all of this in for m in our potential energy formula. So we have rho pi r squared h over two times g times h over two. So that's rho pi r squared h squared over four. So we have pi over four here times the density of water times g times the radius of the tube squared, times 0.02968 meters the height of the water column, and then square that. We get 1.7 times ten to the minus six joules. This potential energy comes from a conservative force as all potential energies do. Potential energy comes from the work done by a conservative force and in this case the conservative force is the surface tension. So that's where the gravitational potential comes from, it's from work done by the surface tension.